John Scalzi takes us for the sixth time for a tour of his Old Man’s War universe, and like the preceding book in this series, The Human Division, he does it in serialized form. This time, however, instead of a number of interconnected short stories he gives us “only” four longer novellas and I must say that they worked far better, for me, than the previous experiment. Even though the short stories of volume 5 brought us, step by step, to the climax and cliffhanger of the book, one that made me quite expectant for the future developments of the story, still they felt more like brief, loosely connected sketches, not unlike the rapid-sequence images of a music video, while the four novellas from The End of All Things possess a more organic flavor, each one of them flowing into the next one and building the broader picture into focus in concentring circles. From my point of view it was therefore a far more satisfying read. The Human Division ended right after the brutal attack on Earth Station, perpetrated by stolen ships piloted by disembodied brains, and the political situation was quite tense, with many Earth governments pointing their finger at the Colonial Union. It was apparent that someone was moving behind the scenes to upset the situation, and in the first novella of The End of all Things we learn about “Equilibrium” a group of aliens, linked to human collaborators, whose goal is to subvert both the Colonial Union and the alien Conclave in an effort to establish a new ruling power, playing both sides against the middle. The narrating voice of this first story is that of Rafe Daquin or, as he defines himself, a brain in a box: he’s one of the pilots kidnapped by Equilibrium whose brains have been removed and installed on stolen ships. Threatened with pain and death, these poor unfortunates have no other choice but to cooperate in the hope of one day recovering their bodies, and so they guide these ships in sneak attacks that fuel the animosity between the various players. Despite the shock of his situation, despite understanding he’s alone and vulnerable, Daquin manages to tap his inner strength and defeat his captors’ purposes in one of the most breath-taking escape scenes I can remember: the character’s unique voice, the way he relates his story, are one of the best examples of what I most enjoy in Scalzi’s writing. The situation itself required a fine balance between contrasting emotions: try to imagine discovering someone removed your brain from the body and made you a slave to their purposes; try to imagine being confined to a dark void most of the time, in sensory deprivation, with only a disembodied voice as your sole contact with the outside world. After the understandable initial shock, though, Daquin reacts and he’s able to both relate what happens and to make caustic comments on his situation and his captors, showing he possesses a core of strength no one suspected. He’s not a square-jawed hero, not by a long shot, but he’s an intelligent, very flexible person forced to deal with a limited set of options and able to adapt to them and come up winning: it’s impossible not to root for him and at the same time find him totally believable. Only Scalzi, through the subtle blending of drama and humor that’s his trademark, could do this in such a convincing way. Here we encounter again one of the players in the previous book, Hafte Sorvalh, the second most important individual in the Conclave hierarchy, and the focus shifts from the adventurous to the political, since the imbalance in the overall situation is affecting this alien United-Nations-like organization as well. If you fear that the pace might slow because of this change in mood, rest assured it’s not so: first because Sorvalh is a fascinating individual, totally alien in outlook (there’s a brief aside on the customs of her civilization that shows how utterly alien her people are), but at the same time also totally relatable from a human standpoint: her pragmatism and directness come across any racial barrier. Second, because the political machinations inside the Conclave itself are as intricate and dangerous as those of Earth: watching Sorvalh navigate these waters, listening to the workings of her mind, is as intriguing as a space battle, if not more. I believe Scalzi must be very fond of this character, because her depths and her many facets are a strong forward-moving element in the story. “We didn’t want to die old,” Powell said. There is no easy answer to this moral question, as it should be – but it forces us to think, and that’s what matters. The last installment in this sequence of stories is the one where the events built until now come together for the grand finale, the showdown between the major players – the Colonial Union, the Conclave and Equilibrium. It also marks the return of the main characters from the previous book – like Harry Wilson and Ambassador Abumwe – and their interaction with the ones presented in this book. It had all the elements to be involving and exhilarating, and it is – but not in a totally satisfactory way. 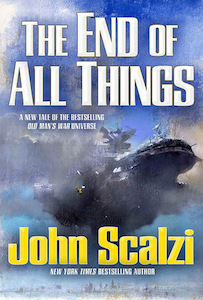 Nonetheless, if sometimes even Homer nods, I guess other authors are allowed to do the same: The End of All Things remains a highly enjoyable book, and a must for all Scalzi fans. I’m thrilled to add that I’ve been contacted by Esther Bochner at Audible with the proposal of sharing a sample of the audiobook for The End of All Things, narrated by Tavia Gilbert and William Dufris. 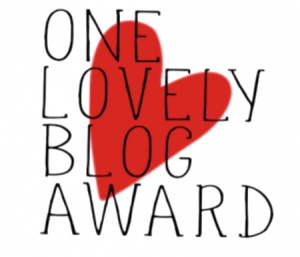 My thanks for this great opportunity to showcase a book I enjoyed in a different way. So here it is, the beginning of The Life of the Mind: enjoy! I must begin my review with a confession: before tackling this book I waited until the next one was published as a sort of… security mechanism, for want of a better definition. This is the extent of my involvement with this series, one that consistently gets better with each fresh installment: the narrative arc and the characters are expanded with a steady, fascinating evolution that is nothing short of addictive. 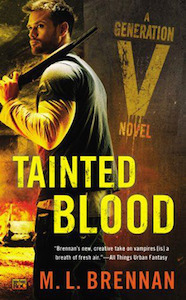 Tainted Blood starts with a dark note: Bhumika, Chivalry Scott’s latest wife, has finally succumbed to the physical ravages of being her husband’s main blood source, so that Chivalry is both in mourning and in no shape to attend to family matters. When a murder in the werebear community calls for Scott intervention, Fortitude is sent to deal with the matter, for once with no emotional or practical support from his brother. This time, however, the investigation itself remains somewhat in the background, because the story is more focused on the inevitable changes that have been brewing since book 1 and that here are visibly gathering speed. Fortitude’s transition to full vampire-hood is now a fact he seems to accept more easily: improved strength, sense of smell, sight and hearing are all positive aspects of this progression, and more than once he notices these changes with something approaching pleasure. Unfortunately the other side of the coin is quite terrifying, and Fort must deal with the awareness that shortly he will not have the option of “saying no” anymore: Bhumika’s death and Chivalry’s search for a new wife/victim are forcing him to face the stark reality of what being a full vampire means. There is a chilling scene in which Fort’s true nature asserts itself for the first time: the loss of control, observed with a sort of interested detachment, and the animalistic pleasure in giving way to such compulsions, make for a nerve-wracking moment, because we are forced to understand, with absolute certainty, that this is the end of innocence, that Fort cannot hope to sidestep his nature any longer. Even more unsettling is the Scotts’ reaction to the event, or rather Prudence’s: she takes on the role of mentor and exhibits a very uncharacteristic softness towards Fortitude, an attitude that compels him to ask her why. The reply is such that my assessment of Prudence changed once again – and I suspect it will not be for the last time: she tells him that “You are my brother. Whether I hate or love you, that fact will never change, and what ties us together can be broken only by death.” Family ties, blood ties, are much more important than any interpersonal dynamics, and the fact that Fort is now transitioning into a full-fledged member of the family – to which Prudence gives her all, no matter what is required of her – brings her to change the way she relates to him. What’s equally fascinating – and not a little worrisome – is the new distance I perceived from Chivalry: if at the beginning of the book it could have been ascribed to his bereavement and search for the next wife, it’s still there at the end, compounded by a hint of judgmental antagonism that was never there before. It made me wonder if the balance between the siblings will not be subject to further adjustments. Of course, Prudence’s brief moment of sisterly almost-affection is immediately counterbalanced by a practical “lesson” on how to feed: the cold ruthlessness she employs with her victim, the lack of any moral consideration, bring back the “old” Prudence, but at the same time they outline Fort’s limited choices in his future as a full vampire. There is a clinical efficiency in the demonstration – enhanced by the sterile environment of Prudence’s kitchen – that is not cruel but merely… pragmatic: only Prudence would have been able to carry it off in such a starkly effective way. It’s impossible not to empathize with Fort as he contemplates the bleak alternatives in front of him: cultivate a “herd” of willing subjects, like his mother, so he can minimize the damage, even though this requires time and careful planning; take wives like Chivalry, with the awareness that they will sicken and die; feed from chosen victims he will have to dispose of before any signs of his activities raise suspicions, as Prudence does. He spends a sleepless night dealing with the harsh math of these choices, battling with the understanding that his survival will entail the destruction of other lives: not surprisingly it’s Suzume who helps him focus on what he wants, and find a different, personal way to minimize the impact of his needs. Suzume – who, in my opinion, is the absolute best creation in these novels – seems the only unchanging fixture in this series: her energy, straightforwardness, clarity of vision, her potential for wicked mischievousness are a constant in Fortitude’s life, and yet in her apparent lack of outward change Suzume is a force for transformation. It’s through her deceptively offhand remarks that Fort finds the path he might travel, just as her humorous comments more often that not help him achieve unexpected conclusions. Suzume’s very nature as shapeshifter is indeed a catalyst for changes, as her unpredictability is the energy that carries those changes to the next level – as we see in a delightfully surprising development…. Transformation and family are the main themes in this novel, and they meld in a single entity when applied to the Scotts: Madeleine’s failing health, due to her extreme old age, has already affected some of the family’s dynamics but the greater impact of the situation – and of her impending death – is on the political side of the Scott “empire”. There are already some maneuvers hinting at a possible shift in power and alliances that will certainly evolve in unforeseeable directions and that are somehow mirrored in the power struggle related to the assassination in the werebears community: only time (and the next books!) will show how these clues will come to fruition. I know for certain, however, that they will be carried out with the flawless blend and drama and humor and with the amusing pop-culture references I’ve come to expect and are one of the trademarks of this brilliant series. This is my last “offering” for R.I.P. X – Readers Imbibing Peril, a fascinating event running from September 1st to October 31st: created by Carl V. Anderson from Stainless Steel Droppings, will be run this year by the Estella Society – follow the link to know everything about it! I received this book from the author, through NetGalley, in exchange for an honest review. There is an intriguing concept at the core of this novel: the part of the world in which the action takes place, the Overland, is governed by the Machine, a mysterious and unseen construct that has ruled for ten thousand years, slowly but surely extending the Overland’s dominion over any known territory. 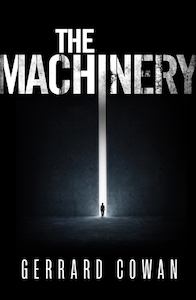 The Machine interacts with the people through the Operator, a timeless character equally shrouded in mystery who acts as a bridge communicating the Machine’s choices in rulers: these are people selected at random from all stations in life, and all ages. No matter how strange or inexplicable some Selections may appear, everyone is convinced that the Machine has chosen well. That is, except for the Doubters. Such a fascinating premise is carried on the virtual shoulders of intriguing characters and concepts: first among them are the Watchers, the Overland’s equivalent of a police force, all-seeing and all powerful, led by Tactician Brightling, one of the Machine’s selections and – to my eyes – the very embodiment of the warning about who watches the watchers. These controllers are both respected and feared, their main task being not so much the keeping of the peace, since the populace seems little inclined to mayhem given their long-ingrained submission to the Machine’s rule, but rather the rooting out of Doubters. The latter seem to be growing in numbers as the prophesied year of doom is upon the Overland, and the general situation places everyone at a crossroads, but none more than the Watchers, uncovering what might be an underlying insecurity in this police force, or maybe in its commanding officer. Two of the main themes that most intrigued me are the kidnapping that happens in the first chapter and the final conquest of the remaining independent territory in the Overland. Young Alexander Paprissi, the son of a renowned merchant and explorer, hears a voice he attributes to the Machine, telling him that it’s breaking down: no one is inclined to believe him and one night the boy is kidnapped by the Operator himself, under the eyes of Alexander’s younger sister Katrina, whose point of view – fifteen years after the fact – will represent one of the main narrative threads in the story. Even more fascinating is the political problem created by the end of expansion: I had the impression that the takeover of the whole Overland territory was one of the means employed by the Machine and its Tacticians to keep the people focused on a shared goal. Now that all has been conquered – unless one intends to cross the sea in search of other lands over which the Machine has no control – something seems to be missing: this concept is discussed fleetingly but there is a definite undercurrent of unease every time it surfaces and it serves well to outline the figure of General Brandione, another great character in the story. It’s nevertheless a factor for instability and it adds its weight to a situation that’s far from predictable. Add to all this the presence of some enigmatic players whose role and goals are beyond undefined, and the constant addition of clues about the possible fulfillment of the dire Prophecy, and you have a compelling book that through flawless pacing and constant, but well measured, shifts in point of view keeps you reading on – sometimes until the small hours. There is a steady increase in tension, a build-up of details, that paints an ever-widening picture that practically challenges you to uncover its hidden secrets. For me there was also an added treat, the suggestion of a more advanced past, now forever lost to memory and committed to legend: it’s the kind of detail that adds depth to a story, even when my questions remain unanswered, or maybe exactly because of that – having all the answers can sometimes be more unsatisfactory than remaining with some open doubts. This is the kind of book that always poses a difficult choice for me: saying more would mean revealing precious clues that should be discovered by readers on their own, saying less seems to pay a disservice to a good story. And then there is the cliffhanger ending, holding a few unexpected surprises, that makes the reading of the next volumes in the trilogy practically mandatory. For my second foray into the 2-month long event called Readers Imbibing Peril, 10th edition – RIP X for short – I’ve chosen to examine a very disturbing episode of Dr. Who, aired as the tenth episode of Season 3. When I was walking my way through Dr. Who’s series on the recommendation of a friend, she warned me about this episode, telling me it was one of the scariest she had ever encountered. I must confess I did not completely believe her: after all I can watch The Walking Dead with impunity (as long as I’m not eating dinner at the same time, that is) and horror movies don’t make me afraid of the slightest noises I might hear in the house. So I sat in front of the tv with something resembling a jaded smile… one that did not last long. The story, in short: the Doctor and his assistant Martha Jones have been trapped in the past (1969 to be precise) without the Tardis, and through the “easter eggs” of a series of DVDs they come in contact with a young woman, Sally Sparrow, to enlist her help in preventing a group of alien creatures, masquerading as stone angels, from taking possession of the Tardis itself. 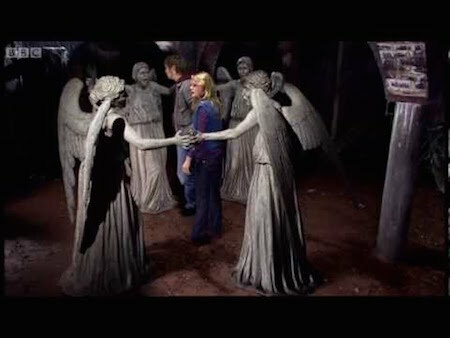 The Weeping Angels, described by the Doctor as “the deadliest, most powerful, most malevolent life-form ever produced”, send their victims into the past, feeding on the potential energy of the life they could have lived in their own time. These creatures look like stone statues depicting angels, and are virtually unmoving when looked at directly, but once the prospective victims take their eyes away (or blink, hence the Doctor’s repeated warning about NOT doing it) they move fast, closing in on the target and transforming from innocuous-looking angels into demonic figures with fangs that resemble a vampire’s. What makes these creatures so terrifying is their ability to move when you’re not looking: the horror genre thrives on the concept of horrible things that go bump into the darkness, and every time we see some character enter a dark room we know something ghastly is going to happen. But with the Angels the characters and the viewers are able to see them, in full daylight – it’s NOT seeing them, not watching them closely that allows them to exercise their peculiar brand of evil. Total concentration is required, the slightest distraction – even one as fleeting as a blink – can bring them close to you, close enough to touch you and send you back into the past. What’s worse is that while the end of the episode seems to re-establish some sort of order, with the Doctor and Martha free once more to roam through time and everyone else settled, the last frames play on our fears once more: the Doctor’s warning is repeated over and over again, as a sequence of images of stone statues – the same we see in plazas or on buildings every day – rolls in front of our eyes. Whatever measure of comfort and newfound safety the viewers might have achieved is shattered by the awareness that the danger lurks around us. And that we’d better NOT BLINK. A new book, or novella as is the case here, from Ashley Capes is always a treat, so when he asked me to read and review his latest work, Crossings, I of course jumped at the opportunity: the core idea was as intriguing as the cover, portraying a kangaroo painted in flames – a sure indication that the author had based this story in his native Australia. Lisa Thomas, the main character, is a woman leading a complicated life: she works at several jobs to make ends meet, also volunteering with a sort of ranger service taking care of wildlife. It’s in this activity that she first comes into contact with a series of uncanny events that will shape her immediate future and change her life: someone is killing wild animals, and in some cases leaving their dead bodies – or parts of them – on her doorstep. As in his other two shorter works I read, The Fairy Wren and A Whisper of Leaves, the author blends details of quite ordinary, everyday life with a touch of weirdness that here is a bit more marked than usual: the background itself does possess some sort of “alien” quality, given the great differences in flora and fauna one can observe in Australia, making it the perfect setting for an otherworldly tale, but the real mystery lies with the never-fully-explained circumstance surrounding the strange apparitions that seem to target Lisa Thomas. I’m wary about revealing more, because it would mean spoiling the surprises in the story, but I liked how in the end there remained more unanswered questions than what we started with at the beginning: the beauty of a mystery, or a puzzle, lies in my opinion in the uncertainty they engender, not in a full revelation of what lies behind them. Crossings works quite well as a stand-alone novella, of course, but at the same time it contains enough core material for a regular novel, because of those unexplained details that seem to hint at a far broader picture. 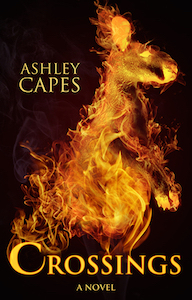 There is also a strong sense of kinship running throughout the story, of a small community that tries to be supportive of its individual members and that comes together in a wonderful way when danger threatens it: this was one of the novella’s most appealing themes, together with the more melancholic thread about old age and failing senses portrayed through Lisa’s father. It’s a subject explored with a light hand and a great deal of compassion and respect, never once sliding into easy pity or unnecessary angst. On the other hand, I encountered some difficulties in relating to the main character, Lisa: at first her troubles created instant sympathy, especially when the subject of her violent ex boyfriend came up, since Ben is a complete, irredeemable jerk, and it’s quite easy to loathe him and side with Lisa. But as the mystery became more complex and she started to obsess over the strange sightings to the point of shunting everything to the sidelines, even her pressing personal problems, my empathy took a downward plunge. In the end, it was this ambivalence that made things even more interesting, because a more straightforwardly likable character would also have been more predictable. Not for the first time I find myself in disagreement with the general consensus about a book: probably the huge amount of praise received by The Martian raised too many expectations, since I went in believing I would find a story about survival against unsurmountable odds, about a man having to face total loneliness and encroaching despair. I believed it would be a great study of the human mind and soul when confronted with terrible obstacles, and a wonderful chance for strong characterization. Sadly, it was not so. 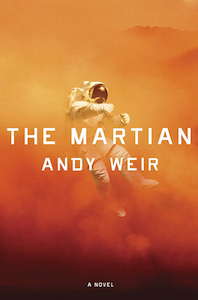 The main character, Mark Watney, does in fact relate his journey of survival on the unforgiving surface of Mars, after the rest of his crew left him for dead on the red planet, but while the narrative gives us a lot of technical details about what the stranded astronaut does to ensure his own survival, I could not grasp anything about the man doing all these things. His journal conveys nothing beyond the reports on his progress on a series of tasks: the subjects of loneliness, fear, isolation, loss of contact with family and friends just are not there. There is not even a single moment when he rants and raves about being left marooned on Mars, the kind of moment everyone would have indulged in before getting on with the business of survival. It would have been the human thing to do, after all. But it does not happen: even when he briefly touches on the subject of his loneliness, it’s more like a passing thought, not unlike those we entertain about the weather, rather than the soul-shattering considerations I expected. The overall tone felt wrong: Watney comes across as chirpy and somewhat immature, not at all the trained, adult scientist he is, the frequent use of “Yay-this!” and “Yay-that!” in his musings stridently at odds with the situation. The only moments when something approaching emotion comes up are those when he makes sarcastic comments about the entertainment programs left behind by his crewmates, jeering and scoffing at the quality of music and tv shows and never – not once – giving a thought to the people he lived and worked with for long months. For the rest of the time Watney makes silly jokes about his life expectancy or the dangers he’s facing, so that I never had the true perception of the danger, of the life-and-death struggles he faces day after day. Of the suspense and uncertainty that should have been this story’s main ingredients. At some point I thought that this might have worked better as a humorous manual (think Hitchhikers’ Guide to the Galaxy) about how to survive on Mars: as such, with no pretense of creating an endangered character, it could have been a fun read. As it is, the dire situation in which Watney finds himself loses any dramatic impact: after a few instances of facing a difficult or life-threatening challenge, going to sleep and then waking up with a brilliant solution, my interest hit rock bottom and never resurfaced again. And there’s one question that kept running through my mind as I read the details of the science Watney employs to ensure his survival: he states that he’s leaving a recording, in the case of his death, for those who will come with the next mission to Mars, so… what’s the need for all those A-to-B-to-C painstaking explanations? He knows that scientists like him will be able to understand implicitly what he did, and will not need to be told the hows and whys of the engineering and chemical processes he’s employing. Watney, or rather the author, is therefore speaking to and for the scientifically uninformed audience, breaking the fourth wall so to speak. And in my opinion breaking the “magic” of the story. This happens again when the focus is shifted to Earth, where after some time the satellite images sent back from Mars make it clear Watney is alive: as everyone works feverishly to try and re-establish communications and mount a rescue expedition, the technical discussions are clearly tailored for the layman’s understanding, through stilted, phony dialogues that are just a vehicle for more exposition. It’s clear that the author either knows these matters intimately or has researched them thoroughly, but for me they completely smother any characterization or story development: if I wanted to learn the most minute details about these subjects I would have tuned in on the Discovery Channel, not looked for them in a work of fiction. And last but not least: where is Mars? Does ever Watney raise his eyes and look at the terrain, scan the horizon? Granted, the place is bleak and desolated but still, at least judging from the pictures sent by the unmanned probes launched over time, it does possess a kind of savage beauty that should have merited a mention or two. It’s something I would have expected, given the novel’s premises, but once more I was disappointed. The Martian might probably work better in the movie adaptation: if the script leaves out Watney’s teenager-style interjections and poor-taste jokes, the too-frequent mentions of the quality and quantity of his excreta (important as they are to his survival), and the long, Ikea-manual-style explanations of such survival techniques, it will have a chance of describing a gripping story, or to offer some necessary humor in a form that I might find more acceptable. I’m sorry to report that the book did nothing of the kind for me, so I gave in to disappointment and gave up the struggle about a third of the way in.